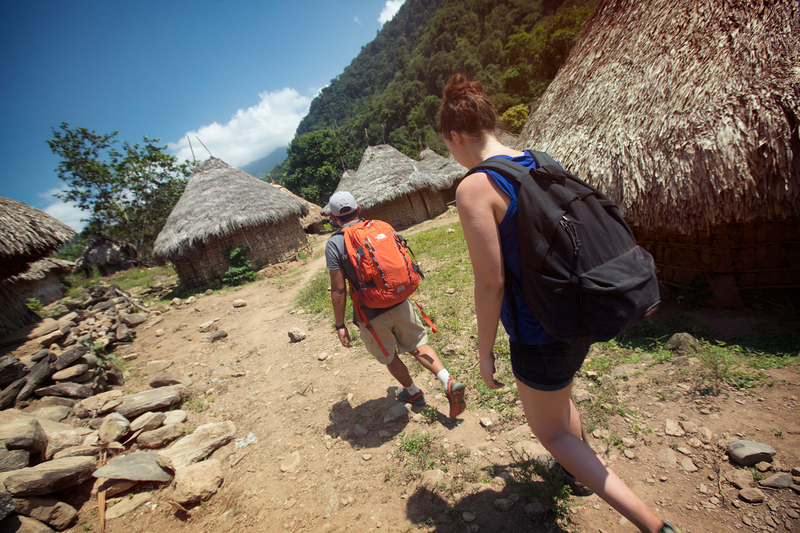 Trekking in Colombia’s Sierra Nevada de Santa Marta was something new to me and that’s what made it so exciting. In the days leading up to my travels, I read up on the Lost City trek, talked to friends who had done it, and wondered about the sights that awaited me. I felt ready to take on anything that came my way – except for the humidity (but more on that later). Although I had come to Colombia to be among nature, I was surprised to discover how cosmopolitan the city of Santa Marta was. It’s the start point of the Lost City trek and it was the first Spanish colonial city in the country. 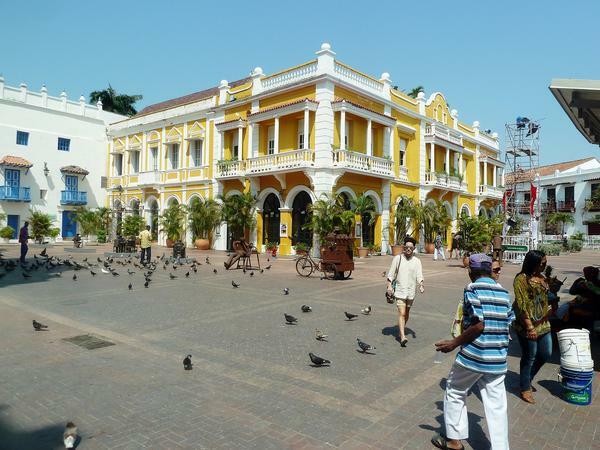 Home to the final resting place of Simon Bolivar (liberator of South America), the city is a mix of colonial-era plazas, narrow winding streets, and an appealing seafront promenade. This is not the Colombia lodged in many of our imaginations. This is an altogether more modern destination. The Plaza de San Pedro Claver in Santa Marta Photo courtesy David S.
The journey out of Santa Marta to the start of the trek is short. We abruptly switched from the paved main road to mountain track before stopping at the village of Machete Pelao for a fresh lunch to get fuelled up. Then it was time to start walking. The trail leads out from the village, and over the next few days, winds through a variety of terrains over farmland and criss-crossing the Buritaca River before it starts to climb upwards. Even though at times the route made my knees creak with every step, I wouldn’t say it was arduous, by any stretch of the imagination. The path follows along the fertile land beside the homes of local communities, providing a reminder that this region has been lived in for many years. 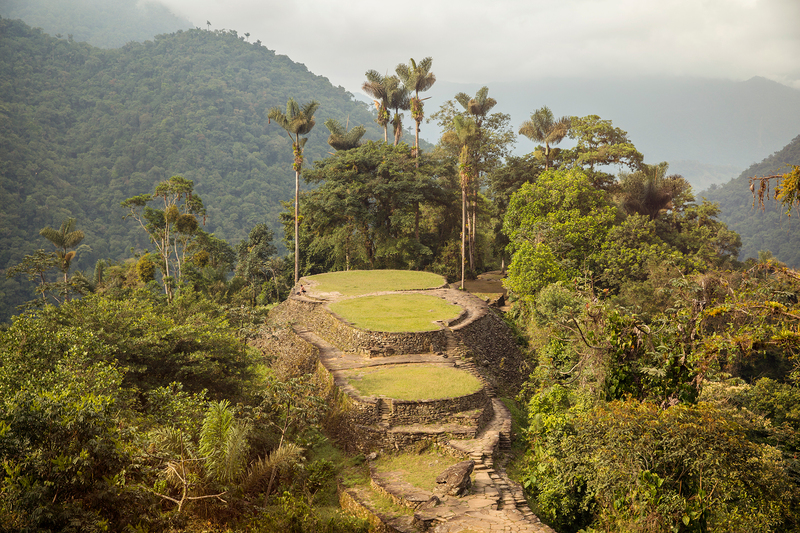 The indigenous Kogi, Wiwa, and Arhuaco tribes have occupied this land for centuries, and they hold the figurative key to the Lost City – one of the reasons it remained “lost” for so long. These communities kept quiet about its existence in order to preserve the location. The path follows along the fertile land beside the homes of local communities. Our guide was from the Wiwa community and wore traditional clothing for the duration of the trail. It was fascinating to learn about his people and how they interact with the land. And, it was easy to see how important these lands are to the communities who live here. Spanish was our guide’s second language. As we walked along, we heard his story of how he left his community in order to gain his guiding qualifications, all so he can continue in his traditions, preserving them for generations to come and sharing them with those who are interested. Having trekked in different corners of the globe, I had my expectations set at a pretty basic level for the campsites along the way. But, with plentiful amounts of food and the chance to buy a much-needed beer at the end of a full day’s trek, not to mention swimming pools at each site, I started to look forward to getting to camp each day. I started looking forward to reaching these bunk beds each day. 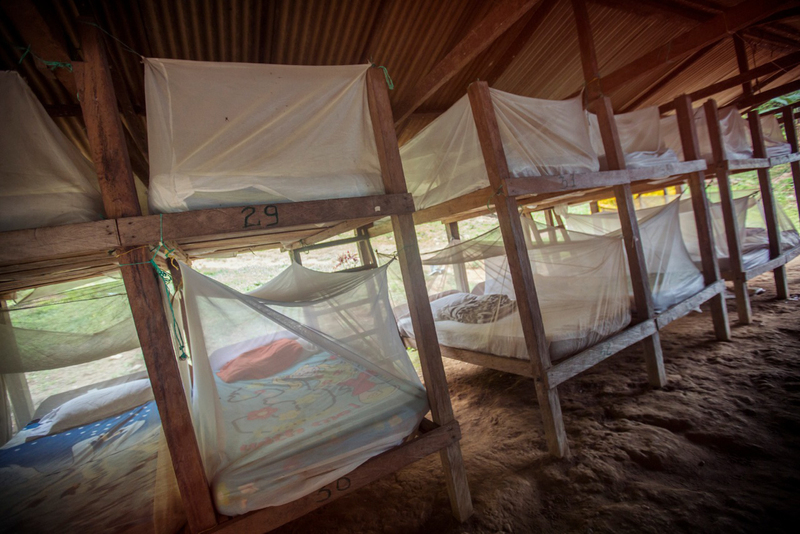 To my pleasant surprise, we were sleeping in bunk beds with mosquito nets on most nights. Even the one night we spent in a hammock was far more comfortable than any swinging bed has the right to be. That night – just as I was falling asleep ¬ – the rains came, bringing with them around 30 frogs and toads into the campsite. They were searching for the bugs also brought out by the rain. Listening to them and the rainfall outside is the magic of Colombia; what would have seemed like a strange occurrence felt totally understandable in this climate. I was grateful for packing light and for bring good trail shoes. The route is not on challenging terrain, but it does ascend sharply, and having a good level of fitness is essential. Scrambling over rocks, through rivers and past waterfalls, it’s easy to feel like one of the original explorers trying to find the city. Following the path of the Buritaca River for a lot of the journey provides a real benefit not often available on many treks. As the river winds alongside the trail, there is ample time to stop and take a dip in the cool, clear waters. This luxury fast becomes an unforgettable part of the experience. 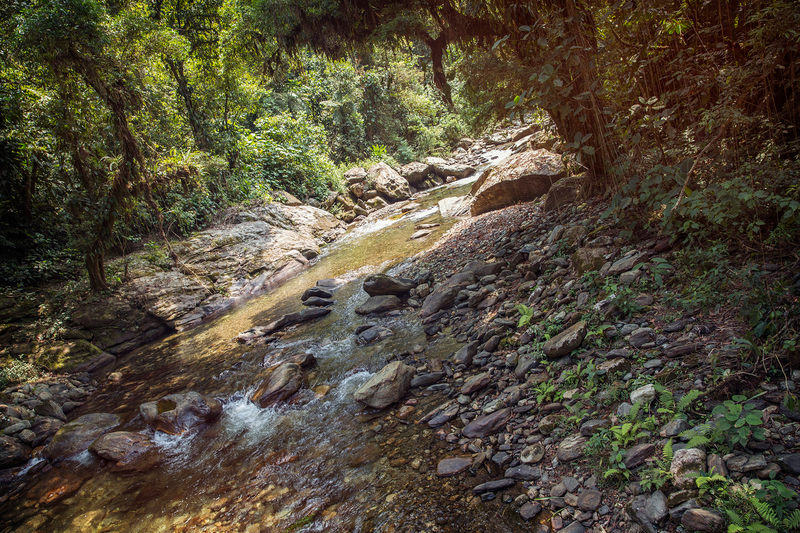 Stopping for a few seconds to take in the surrounding jungle from a sun-dappled stretch of river reminded me of the sheer beauty of this area. The river serves as the antidote to the thick, undying humidity. A lot of this trek is through jungle, and a lot is uphill. Despite constant supplies of drinking water, the challenge of the oppressive heat made each uphill stretch feel longer, and each swimming hole was made all that more inviting. The antidote to the thick, undying humidity. After three days of trekking, an early rise on the fourth day gets you to the Lost City itself. But not before really working for it! The city is reached by hiking up 1,200 steps. The ruins are the reward. Once you’ve reached the top, heading into the ruins themselves, the site opens up into a clearing, and you start to understand why the indigenous communities believe in the mountains as spirits. The sun-illuminated, wide-open space of the Lost City is the perfect place to contemplate the densely covered jungle that surrounds it. And, as more is uncovered, what is obvious to everyone is that there is a place of regal splendour high above the mountains. Returning to camp (and after a swim), it was time to get back on the path again. The way out is on the same path so it’s far easier as what was uphill is now downhill. Although the humidity remains, the route is quicker and knowing how far there is to go each day, it does not feel as tough. Back in Santa Marta, sitting in a plaza having returned to civilization, I had the chance to reflect on the challenges and the beauty I experienced on the trek. The feeling of exhaustion after climbing those 1,200 steps being immediately replaced by the feeling one has when they cast eyes on something beautiful felt to me like a little bit of magic. 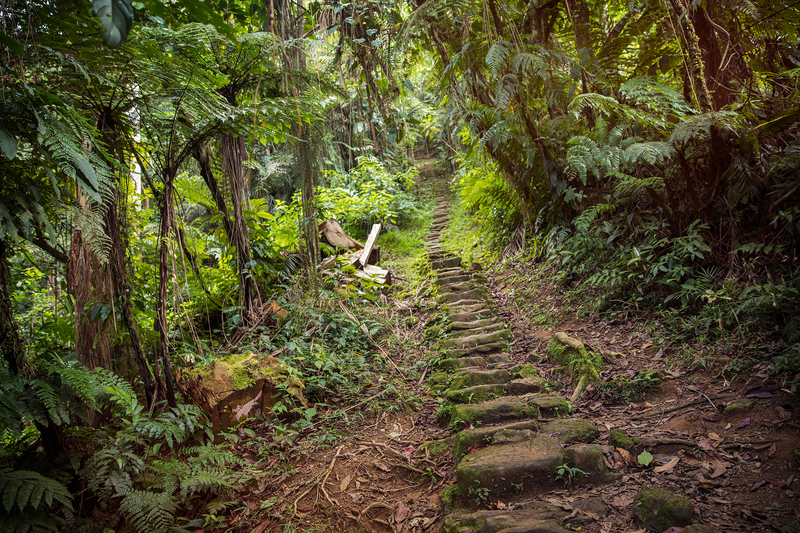 And that’s something that is uncovered by everyone who takes on the challenge of trekking to the Lost City, a reward to each visitor who takes a closer look at this amazing part of the world. Want to find the [Lost City[(https://www.gadventures.com/trips/colombia-lost-city-trekking/SMLC/2015/) yourself? 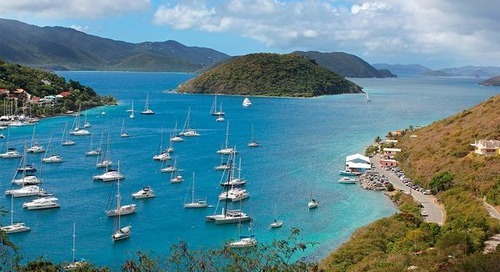 G Adventures runs a number of departures encompassing a wide range of departure dates. We’re thrilled at the prospect of showing you this big blue planet of ours — check out our small group trips here. Watch as glittering icebergs break off and drift out to sea.